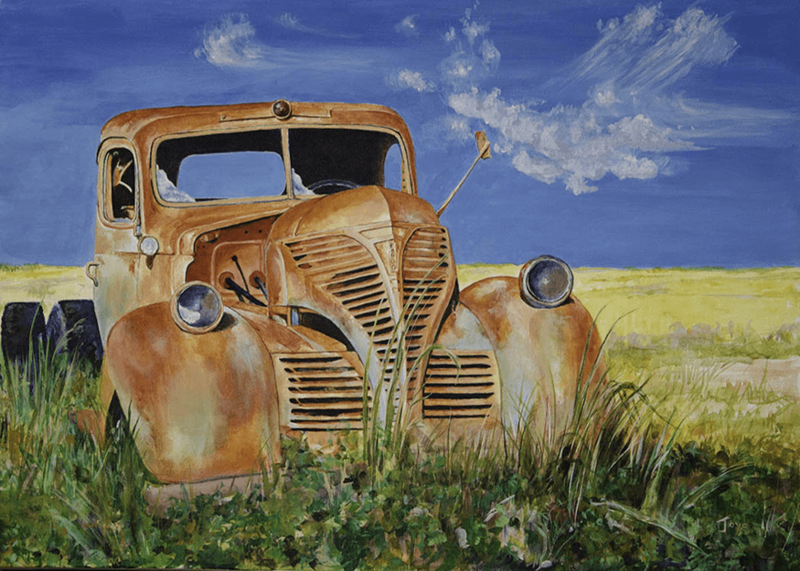 My works are not a sentimental journey into a past way of life on the Canadian prairie, but a visualization of the laws of entropy and our endless march towards change regardless of its value. We can lament the lost landscapes of grain elevators, threshing machines, fields of stooked sheaves of grain, but should we? Is the new way of life better? What is progress and what is the cost? There is a deep contradiction between urbanization, mechanization, population growth, food production, and the eventual crisis of natural limits. Entropy is one factor and embodies the physical laws that our earth is like a clock running down. A second factor and in fact, another dimension of entropy is the limit of the earth’s capacity to keep providing arable land, minerals, fuels and just living space. The castoff machinery of the past embody the message. We create machinery and soil enhancements to better crop yields while poisoning insects and unwanted plants to feed an ever growing population. At the outer limit of this pattern of growth is a crisis. This is a process that has been repeated historically since the disappearance of the large game animals in the Paleolithic and the rise of agriculture. With each crisis, human kind has found new technologies and methods to survive and flourish. Are we reaching a new but insurmountable crisis? The rusting and valueless machinery of the past symbolize this unceasing movement. Time moves only one way. There is no return. We are carried along in the river of time, heedless and not in control of our destination. What will our future collective choices be?